Surprisingly, from all the touring books I've read, most of the incident occur in developed world countries, such as America, UK, France etc. Despite people's advice on how to be careful in developing world countries, it's actually the developed world countries we have to look out for. My theory is that we're so worried about the developing countries that we already are a little careful, much like riding without a helmet that you're perhaps more aware of what you might become if you crashed, but when riding in a developed countries, you're a lots more relaxed because you know bad thing rarely happened there, quite akin to riding with a helmet, giving the sense of security, and before you know it, bang. It happened to Barbara Savage who wrote a book called "Miles from Nowhere: A Round the World Bicycle Adventure", she sadly got killed in a collision with a motorised vehicle in her home town of the US despite surviving her tour with her husband around the world having some near misses (especially in India). ^^ bloody hell. Poor woman. I guess the facts and figures response of 'most accidents happen in & around the home' are more true than we'd like to believe, most people I know that have had accidents of any significance (bike/car/walking/mucking about) within a few miles or less. Take care out there people. Wow did he ever go to the tour? interesing route, did you ever map it? also - have i missed a newer travel tips for europe thread?? Does anyone know much about getting equipment/bikes back to the UK? Has anyone reached a destination in Europe with all their gear jumped on a plane with some of it? Maybe posted some bits back etc? Or book it all in as extra baggage on the flight etc? Planning a trip that will end in Belgrade later this summer and will want to bring most of if not all my equipment back I am sure! Any tips/blogs of people tackling this would be ideal. I ended up in rome once with a broken knee, and had to buy a ticket home on easyjet. Spent the next day finding a bike box and doing some sightseeing, then flew home to luton. Don't remember it being that tricky - was a bit upset to cut the trip short though. I've ridden to the airport, checked the bike in as is, carried the panniers on as hand luggage and then ridden away again, after inflating the tyres, at the other end. You obviously run the risk of the bike getting damaged but you've two schools of thought when it comes to flying with a bike; pack it up so it's bombproof, or put it on without packaging and hope the baggage handlers treat it with care. Without packaging aka just rolling bike into the airport and putting it on as luggage?! Yep, I did the same before after much debate at Casablanca airport, but managed to (BA). Only downside is a small dent on the top tube. Yes. Most airlines will make you remove the pedals and deflate the tyres (although I always leave 20 psi in to protect the rims) and some will give you a see through bag to put the bike in. I've also taken my bike on a plane sans box. Got two bikes to Aix and back without any incident. CTC recommended plastic bike bags are what I used. posting this in two threads to try and get some info/tips. 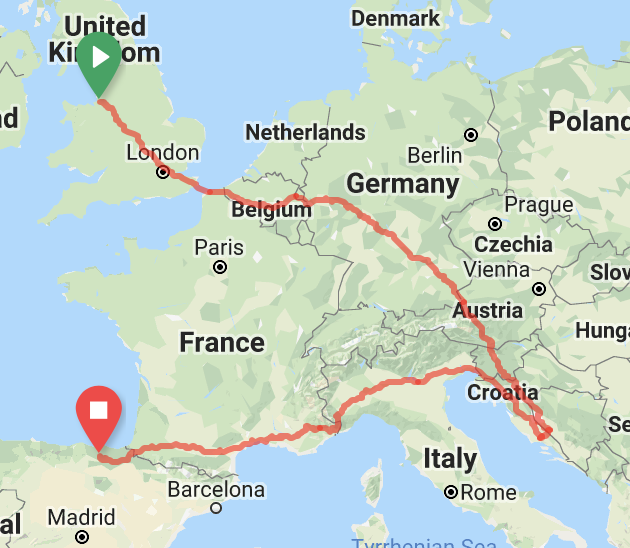 Planning on doing some of this with my uni mate who is planning to do a huge Europe tour in summer for about 2 months. Noted down to check Euro Velo.